Manchester, New Hampshire (CNN) – As Mitt Romney moved to seize the mantle of presumptive Republican nominee in a New Hampshire speech Tuesday night - and won the evening's five primaries - his campaign was aggressively working behind the scenes to build up a general election operation, a campaign adviser said. The campaign cast Romney's Manchester speech – in the state that handed him his first primary victory this cycle and where he maintains a summer home – as a pivot to the general election campaign. In his address, Romney noted the connection to his campaign's beginnings. "We launched this campaign not far from here on a beautiful June day. It has been long and extraordinarily rewarding," he said. The candidate noted the battle for the GOP nomination has encompassed "43 primaries and caucuses, many long days and not a few long nights." In his speech, Romney maintained his argument that the presidency of Barack Obama has been an economic failure. Romney also addressed the issue of wealth and financial success - a thorny issue around which he has stumbled in the campaign trail. 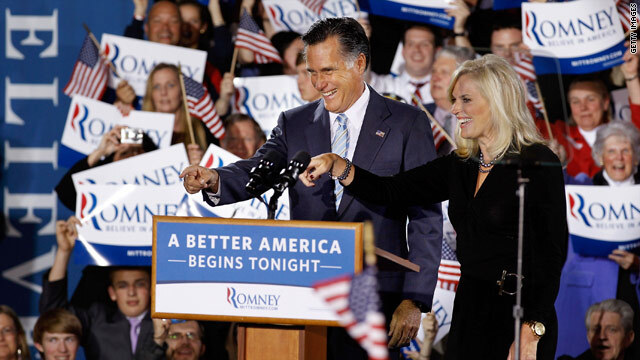 "I see an America with a growing middle class, with rising standards of living," Romney said. "I see children even more successful than their parents – some successful even beyond their wildest dreams – and others congratulating them for their achievement, not attacking them for it." Ahead of the speech, a Romney campaign adviser painted the event as a general election kick-off. "I think tonight marks a dividing line, because now the public is going to be paying more, or closer, attention to the contest now that it's down to two people," the adviser said. "And the choice could not be clearer." In a statement following Romney's projected wins, Obama's campaign press secretary Ben LaBolt seemed to agree that the contest had reached a new stage. "Mitt Romney has spent the past year out on the campaign trail tearing down the President with a negative message that even Republicans who have endorsed him have criticized," LaBolt said. "This marks the end of that monologue. Now he must put his record and his agenda next to the President's." Continuing the strategy he has used in a series of recent speeches, Romney laid out the differences between himself and the president regarding the country's economic future, and presented himself as the experienced hand needed to turn the country around. "Incumbent presidents don't get to run on vision," the adviser said. "They have to run on their record, and we're going to hold him accountable starting with tonight's speech." The adviser acknowledged that some voters "may have limited information" about Romney and his record, and promised that "going forward they're going to learn more details about his record of success and his plan for jobs and the economy." Meanwhile, the campaign is engaged in a "rapid build-out" of its organization and was concentrating on hiring more staff at its Boston headquarters and in some key states, the adviser said. The adviser said part of the transition to general election mode would include expanding press access to Romney's fundraisers, and said pooled media access to those events would be established as early as next week. In speeches over the past week, Romney has ignored his GOP rivals and focused the majority of his time on attacking Obama's record. He has offered a "prebuttal" to the president's convention speech – scheduled for September – and trailed the president to Ohio to argue Obama had not followed through on his 2008 campaign promises. As the campaign moves forward, the adviser said Romney will continue making more "direct engagement" with President Obama, and cited "some of the exchanges we've had over the past seven to 10 days" with the president as proof the general election has begun. The campaigns have tussled over the support of Latinos, youth, women and even dog lovers in recent days. If you are for the Ryan Plan we pretty much know what you stand for. No thanks. Fairness for all sounds better to me. to prove us wrong. Bet he won't, because he can't. so in other words all the talk during the primaries was just to get the base that doesn't trust you to get on your side. Just HOW many Mitt Romney's are there and will we ever meet the real one. "the public is going to be paying more, or closer, attention to the contest now that it's down to two people,"
That's right. It's down to Romney vs. Romney. All they need to do is play video of anything that he "stands" for today and it will be the exact opposite of yesterday. They could put two monitors side by side and let him debate himself. Well, you didn't turn mass around as gov and left them with a 1 billion dallar defict for the incoming gov and 47 th in job creation and where are the disk drives you stole which are gov property even though you made your staff pay for them with your money to try and get your self off the hook, I'm sure this will come up again before Nov,I'd like to hear your answer???? If you are for the Ryan Plan we pretty much know what you stand for. Butyouarefooled, the Ryan Plan would suggest Mitt Romney is for saving entitlements rather than ignoring their demise, growing the economy for All Americans and getting the national debt to actually decrease for the benefit of America's future. Nice photo of Rmoney waving goodbuy to American jobs as he increases tax benefits to global megacorporations that are outsourcing your jobs... he's an American worker's nightmare. Why did Romoney invest so much money in other countries? Every time I have the displeasure of hearing him speak he is pivoting in a different direction. So what's new about this? I'm sure Romney is a decent fellow (well, maybe), but he is decidedly not presidential material. Obama, while not perfect, has proven himself to be a leader who is willing to make and stand behind unpopular but necessary decisions. He's got my vote. He hasn't even won the Republican Primary. He's been trying to "pivot" to a general election for almost 8 years. Why don't you report the actual delegates that were secured last weekend? Is it because Ron Paul won Iowa? Minnesota? I don't even care about the election, it doesn't matter. I'm just tired of having to see his name everywhere and have yet to find a true supporter. I know people say it all the time, but this is just too bad. Ho hum. Yawn. Well in other news. People are actually trying to go on with their lives without any politician and their honorary pledges of life in paradise. Romney bill speech as general clip flop. Romney we know you are aimed to please. You will run from your lunatic fringe now, bit when you are not worried about the general election anymore, who are you gonna run to. Are we about to see another Scott walker in the makings. The people already knows your too week to run the now rabid Republican party. This economy cannot afford to be hit with a European style austerity movement. Europe is looking on us with envy because we are growing at 2 and 3 percent, and they are growing at . 3 percent. Lesson America cannot take another sucking out of our money from our economy by the rich so they can put into Swiss bank account and Kay man island hide aways. We need the money here to circulate in our economy so that small businesses can get some and hire local folks. Reagan Ah the GOP love the memory of Reagan.. Ronald Reagan sold WMD's to Saddam in Iraq..that we had to go to war with twice to get back...and even then the YellowCake ended up in Iran's nuky program...and Reagan sold weapons and parts and even SAM missiles to Iran during the Iran-Iraq War...1980-1988..the years Reagan was in office..how nice..
And Reagan sold Diluted Agent Orange to Saddam in the Form of Roundup, to use as a nerve gas on the Iranians, and the Iraqi Kurds..while pushing hard to deny the Vietnam veterans claims about really bad side effects form Agent Orange in Vietnam..and closed the Veterans homes to returning Vietnam War Veterans..ending 100 years of helping the WarVets readjust to civilian life..
Four more years is very bad. Romney is much worse. Mitt Romney has been on the campaign trail for about eight years now. He's constantly been in the media attacking our president. I can't imagine he has anything new to show us. He's colossally overexposed. "Incumbent presidents don't get to run on vision," the adviser said. "They have to run on their record". Amen to that. If Americans understood this, Romney would be polling FAR ahead of Obama. So funny that liberals are going to try to paint Romney as a flip-flopper, when Obama has reversed his positions just as much and as often as Romney. That is what politicians do people. It is ironic that Romney would claim victory in winning over the GOP on the same day health officials find evidence of Mad Cow Disease in our food supply. Let's not vote for Obama. Romney may win (as the results are processing) RI and CT, others may follow.